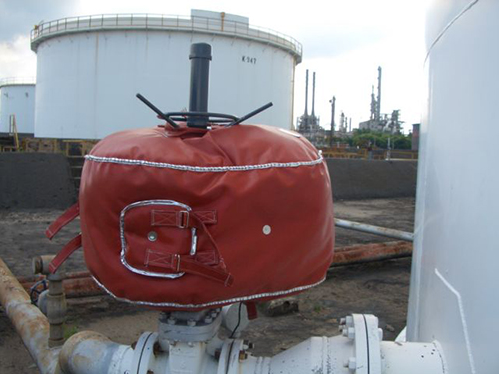 A Shannon Rapid Rise Fire Blanket covers a valve actuator located at a refinery. Shannon Enterprises of W.N.Y., Inc., the world leading designer and maker of reusable thermal and acoustic insulation, has designed a new self-contained, removable protective enclosure called the Shannon Rapid Rise Fire Blanket to protect petrochemical, oil & gas, power generation, marine and military equipment from extreme temperatures. Shannon custom fits its Rapid Rise Fire Blankets to match a wide variety of equipment surface geometry. Customers can easily install, remove and reuse the flexible blanket enclosures. Shannon can design the new blanket to fit components ranging from actuators to valves. The Shannon Rapid Rise Fire Blanket (model number: HT2000MSiTSiM) exceeds the UL1709 Rapid Rise Fire Test method, which is a rapid-rise fire reaching 2000 degrees Fahrenheit within five minutes and maintaining this temperature until failure. Rapid Rise Fire Blankets have not only withstood the test’s minimum requirement of 30 minutes but have also lasted for more than three hours. Industry professionals consider the UL1709 test procedure as the benchmark standard for many applications including: structural columns, valve actuators, cable trays, instrumentation, valve bodies and more. Each Shannon Rapid Rise Fire Blanket comes with a 10-year warranty. Shannon developed the fire blanket’s durable outer jacketing to match harsh operating conditions found, for example, at processing plants and onboard marine vessels and oil platforms. Shannon initially produced its CAD-designed, CNC-produced fire blanket to protect shutoff valves in oil refineries. Shannon expanded on this initial design with a range of fire blankets that now protect wafer, butterfly, knife-gate and motor-operated valves as well as actuators. Call or email us today to request a quote or learn how the Rapid Rise Fire Blanket can lower your insurance premiums!